With the Westco™ series, no job is too large or too small. Since its introduction, the Westco™ window has been used in a wide variety of commercial, institutional, and residential facilities including schools, restaurants, hotels, factories, room enclosures, and condominiums, just to name a few. All Westco™ series windows are constructed of high quality Thermally Broken Aluminum extrusions, which are specially designed to resist the transfer of heat and cold through the window. 7/8" Insulated Glass is used for improved thermal efficiency. 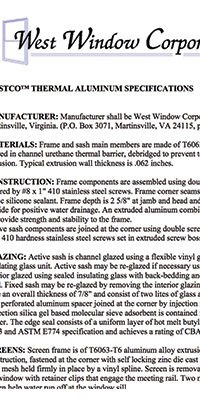 Westco™ windows are made with glass produced in the USA, which we believe is the highest quality available. Dual weatherstripping at the interlock, coupled with fin-seal weatherstripping along the sash stiles provides exceptional protection against air infiltration. 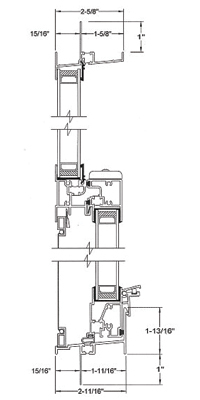 A rubber bulb compression seal on the bottom sash provides tight closure at the frame sill. The Westco™ single hung uses a concealed, quiet spiral balance system which makes raising and lowering of the active sash easy. The balance system is fully adjustable, should adjustments ever be required. Slider active sashes glide smoothly on two long-lasting dual-wheel rollers. Spring loaded extruded aluminum lock clip snaps into place when the sash is closed, providing secure closure. Integral sash lift and pull rails are extruded aluminum - no screwed on handles to break off or replace. Frame, sash, and screen are made of heavy duty extruded aluminum for strength and long service life. Electrostatically applied enamel finishes are durable and long lasting. Single Hung bottom sash tilts in and Slider active sash lifts out for cleaning. The Westco™ series consists of: Single Hung, Two Section Slider(XO or OX), Three Section Slider (XOX or OXO), and Fixed Picture Window. An integral muntin is available to divide the lite as required. Mulls for multiple window installations are also available. The Westco™ series is available in box frame for retrofit installations, or with an extruded aluminum nailing fin for new construction applications. Frame depth is 2-5/8 inches. Numerous glass options are available, including colonial grids located between the glass for easy cleaning. Windows are among the primary elements of architectural design, remodeling and renovation work. The Westco™ window line provides a modern architectural solution to increasingly demanding project designs. The Westco™ fixed picture window can be made in a variety of shapes, sizes, and configurations, and can be joined together with single hungs or sliders to create an enduring, timeless appearance. Campbell Court Elementary School, Bassett, VA. Westco™ single hung windows with transoms and one-inch contoured muntins replicate the architectural detail of the original windows, preserving the character and charm of this historic 1937 school. Modern Low-E insulated glazing and thermally broken frame members provide energy saving benefits, reduce noise transmission, and help create an improved learning environment. The Gauntlet Golf Club at St. James Plantation, Southport, North Carolina Westco™ quarter arches, circle tops, and sliders were used in this elegantly designed structure. Gulf Shores Condominiums, Venice, Florida Westco™ slider and fixed picture window combinations were used to transform outdoor balconies into beautiful living spaces. Holiday Inn Express, Conover North Carolina Westco™ single hungs with colonial grids impart a residential warmth to the building while providing the ruggedness required of a commercial installation.